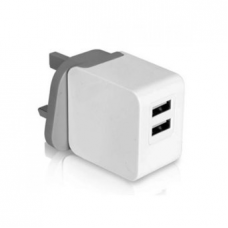 Dual USB port 15W/3.1A wall charger (TR205) allows you to fast charge 2 devices simultaneously. You can use your existing USB charging cable to charge your iPad, iPhone, Samsung Tab, Kindle fire, HTC, Blackberry and more. With it's compact and sleek design it's perfect for travel or home use. 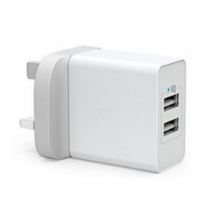 * Dual port design, can charge 2 devices simultaneously. * Output: DC5V,3.1A（Share 3.1A when both ports in use). * Input: AC 100~240V, 50~60Hz. * Certification: CB, CE, UL and Rohs.